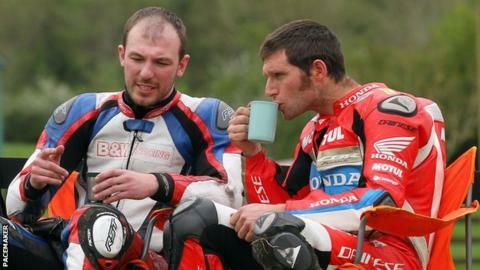 Guy Martin escaped injury as he slid out of his opening race at the Tandragee 100 road racing meeting in Northern Ireland on Saturday. Lincolnshire rider Martin, who is also a TV presenter, was back competing on Irish roads for the first time since being injured at the 2015 Dundrod 150. Martin, 35, suffered vertebrae and sternum fractures in the 2015 crash. Saturday's Tandragee meeting was eventually abandoned after a rider was injured in the senior support race. After being stabilised at the scene of the crash, the unnamed rider was taken to hospital and following the delays, with rain falling heavily, organisers cancelled the remaining classes which included the supertwin and main superbike race. There were no further details on the injured rider's condition. Martin, competing for Honda Racing, tangled with Magherafelt rider Paul Jordan at the Marlacoo corner on the first lap of the earlier Open Superbike race. Jordan was also unhurt and was also pictured sitting alongside Martin following the race. Martin plans to race at next weekend's Cookstown 100 in Northern Ireland as he builds up to this season's major international events, the North West 200 and Isle of Man TT. Dublin rider Derek Sheils won the opening Superbike race at Tandragee as he finished 14 seconds ahead of William Dunlop, with Derek McGee completing the podium positions. The same three riders occupied the podium spots in the opening supersport race with Mullingar man McGee coming home comfortably ahead of Dunlop and Sheils, with Jordan placing fourth. Adam McLean won the Moto3/125cc race ahead of Sam Wilson and Nigel Moore, while Darryl Tweed was the lightweight supersport victor.